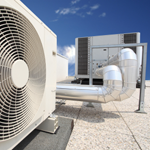 The Commercial Department at McKinney Heating & Air Conditioning, Inc. is here to serve all your needs, from light commercial to industrial HVAC applications. We are a company that is committed to excellence in every aspect, from installation to service to customer care. Give us a call and let us take care of all your commercial needs. We are experienced in the installation and servicing of new stand alone and Wi-Fi energy management systems.